Select Length 5" 8" 11" 14"
Our releasable Nylon wire ties are simple to use, featuring a trigger release mechanism, which can be released with one hand. Just press tab, release and re-use. They are the perfect solution for a wide variety of wire and cable bundling applications, which can be used over and over again. Each time used, these reusable cable ties will continue providing a secure and reliable hold. No need to cut cable ties to add of remove bundled cables with these cable ties. Not only are these cable ties reusable, their smooth edges are comfortable to work with and they can be easily and finely adjusted to fit bundles of all sizes. The pawl type of release mechanism is also available, but the trigger release is stronger (50 LB vs. 40 LB). Both types of releasable cable ties are great for temporary fastening and wire harnesses that require rework. If you prefer the pawl type, please feel free to contact us. Please note that all of the trigger release reusable cable ties are all 50 pound loop tensile. Pawl type releasable reusable cable ties have a 40 pound loop tensile. Buyheatshrink.com has a variety of trigger releasable cable ties available for purchase. 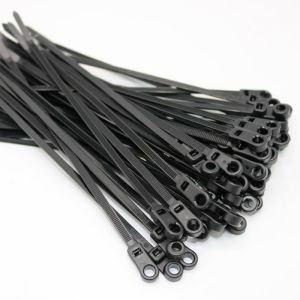 Ranging from nominal sizes of 5” to 14”, and available in black or natural colors, each bag of the trigger releasable cable ties come in quantities of 100. 5" CTRE05 5" 5.9" 1.3"
8" CTRE08 8" 7.8" 2.0"
11" CTRE11 11" 11.8" 3.0"
14" CTRE14 14" 14.6" 4.0"
Our reusable nylon cable ties are simple to use, featuring a trigger release mechanism, which can be released with one hand. Just press tab, release and re-use. They are the perfect solution for a wide variety of wire and cable bundling applications, which can be used over and over again. Each time used, these reusable cable ties will continue providing a secure and reliable hold. No need to cut cable ties to add of remove bundled cables with these cable ties. Not only are these cable ties reusable, their smooth edges are comfortable to work with and they can be easily and finely adjusted to fit bundles of all sizes. The pawl type of release mechanism is also available, but the trigger release is stronger (50 LB vs. 40 LB). Both types of releasable cable ties are great for temporary fastening and wire harnesses that require rework. If you prefer the pawl type, please feel free to contact us.